Why buy records? There are plenty of answers to this question, but most people opt for records because of the joy of analog sound or a love of the aesthetics of a vinyl record. I've always liked to support the artist and buy their work and much prefer to have a physical thing rather than a downloaded track. I used to listen to my mums collection of records as a child, lots of Motown, reggae and bands like The Police and The Boomtown Rats. I had a few record of my own which had Disney songs on that are so scratched now, five year old Gemma did not look after her records. My mums Motown records (which now live with me) are also a bit scratched but I love them all the same. I didn't really start my own collection until I went to university and my mum bought me a little turntable which plugged into my Hi-Fi for my halls of residence room. I would buy a single every week, mainly from whatever Indie band I liked that week like Maximo Park and The Futureheads. I've started to look back and fill the gaps in my collection now. I've slowly started purchasing classics like Rumours by Fleetwood Mac and The Rise and Fall of Ziggy Stardust and the Spiders from Mars by David Bowie. I'm also a fan of 60s girl groups like the Shangri Las and The Shirelles so they are starting to feature heavily in my collection too. 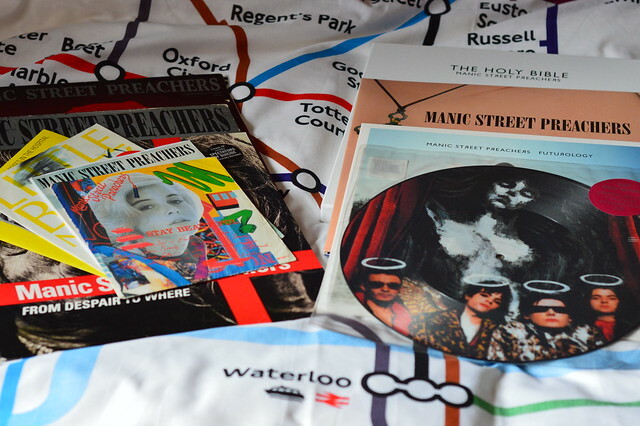 Some artists feature more that others like the Manic Street Preachers. I would definitely like to own everything they released at some point. Most of these were picked up on eBay, I wait for them to not release and album for a while and the prices drop. They are touring now so interest in them is high which means prices are a bit steep for me. 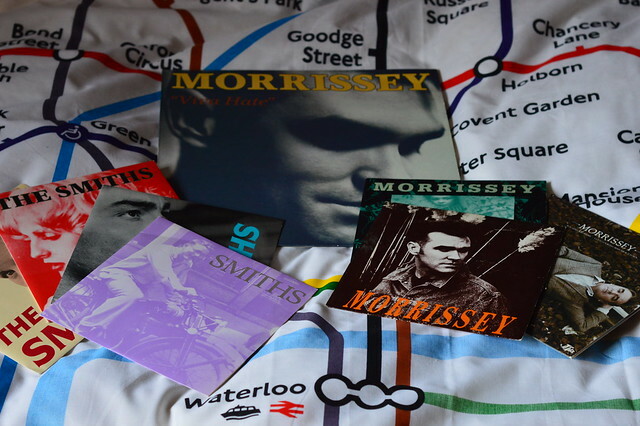 I was formerly a bit obsessed with Morrissey and had loads of his records and those of The Smiths. All my records were on the floor in my bedroom and when Sookie was a puppy she chewed loads and mainly my lovely pristine Smiths ones with all the original posters. I had a little cry (how pathetic) but you can't be angry with her with that cute little face for long. Lots of my other favourite bands feature too so there's lots of Suede, Bowie, The Maccabees, New Order and The Cure but there's always room for some Taylor Swfit. 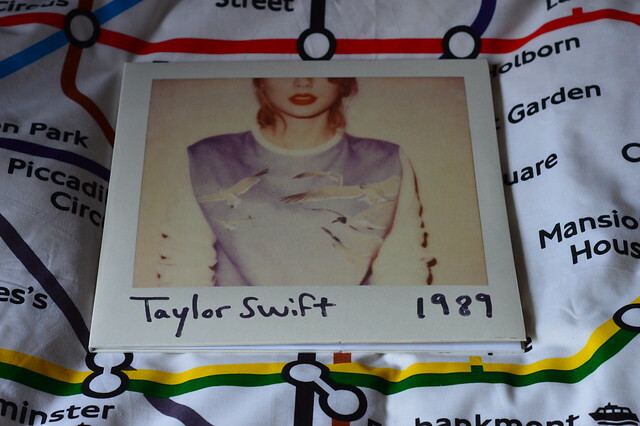 Not going to lie, 1989 was totally my album of 2014. My record collection definitely isn't about investing and making money and it's not about being cool. I buy what I like, pick things up for cheap in charity shops or support the new artists that I like by buying their music. I've only got around 80 records and some are still at my mums house so they don't take up too much room at the moment. Martyn has got loads and his take up most of our IKEA kallax storage unit. You can see some of his records below. Lots of Nirvana, Hot Water Music stuff and bands like Descendents. 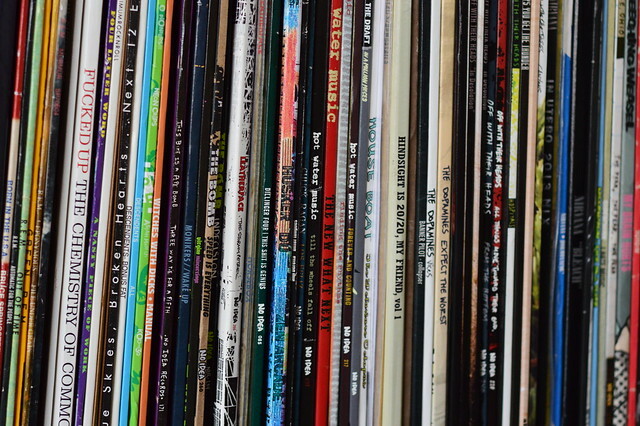 If you want to start collecting, it's important to remember to never stack your records. Always store them standing up vertically in a dry and cool place. 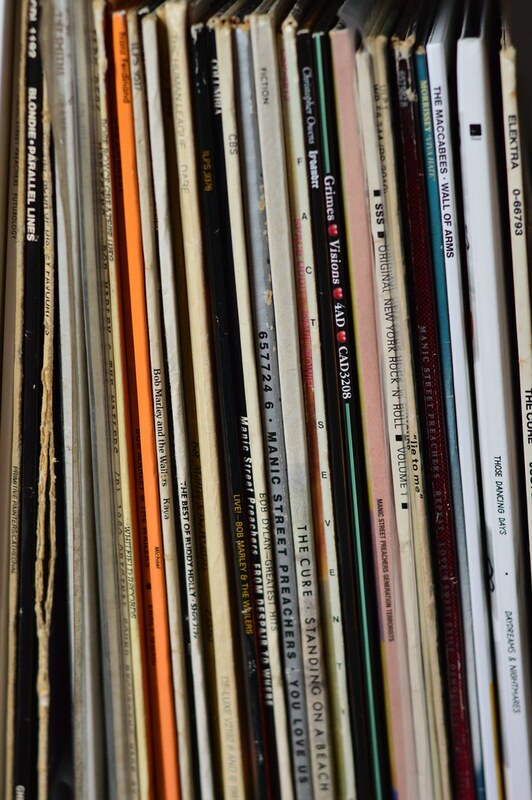 When you stack records, you run the risk of the vinyl warping, which will distort the sound. If a record warps, it cannot be fixed. Do you still buy music? Do you know any good record shops I should check out in the UK? Your collection is so beautiful! ♥ You probably know this already but the oldest record shop in the world is here in Cardiff. Spillers Records! I love Spillers, not too keen on it's new location though. Feels a bit bland in there. I'm sure it will feel the same once they've settle in. I like the charity shops down Albany Rd too and Kelly's upstairs in the indoor market. Newport has a great shop too (an episode of Doctor Who) was filmed there. Great collection! It makes me feel all nostalgic looking at your collection. whoa it looks like we have a lot of the same stuff. We have tons of Bowie, Johnny Cash and a bit older stuff from the 30s/40s but also Hollie has loads of Manics, Suede and limited edition stuff like Jack White and more rockabilly stuff like Pokey LeFarge. Sweet! We don't buy many but I do love the bigger sound that comes with them. We have some funny old ones, big band stuff too, loads of fun! Futureheads, that takes me back. One of the guys from Futureheads plays with Frankie & the Heartstrings now. I did love that band. I on;y try to pick up things I really like rather than trying to make it a huge collection. I get a lot of joy finding something by a favourite band of mine for under a fiver in a charity shop. Great post gem and what a lovely story too. My mum threw lots of her records away back in the day must to my annoyance but I'm glad Steve has a super collection and I love trying to collect more. I have a love of 7" single. I was so happy to complete my Belle and Sebastian collection. The Ziggy Stardust album is my favourite record my parents had. They're under instruction to never throw them out without me having a rifle through. I love records, my parents have awesome collections. The Beetles, Bob Marley, Michael Jackson. My first record was Madonnas Holiday/True Blue single. Great memories but they did take up so much space. I'm more of a CD person, I cant throw away my collection and cant get used to itunes. haha! Great post and thanks for sharing! 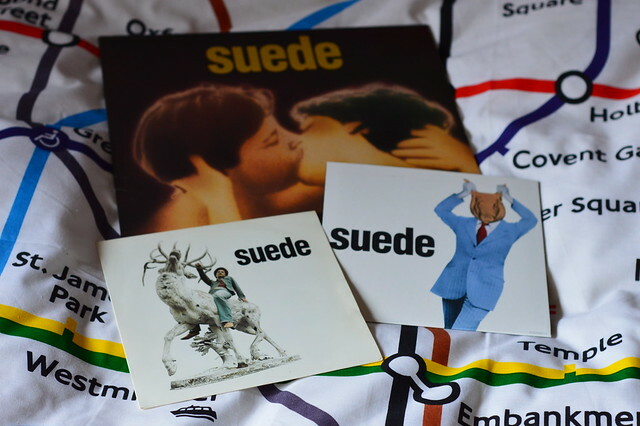 I only own a couple of vinyls, but there's something so beautiful and ritualisic about playing one! Yey for records. I've given up remembering how many we have, discogs says 1000+ but there's another couple of hundred on jazz, blues & classic records that aren't in it's catalog. We ended up turning one of our spare rooms into a record room just to have everything in one place. 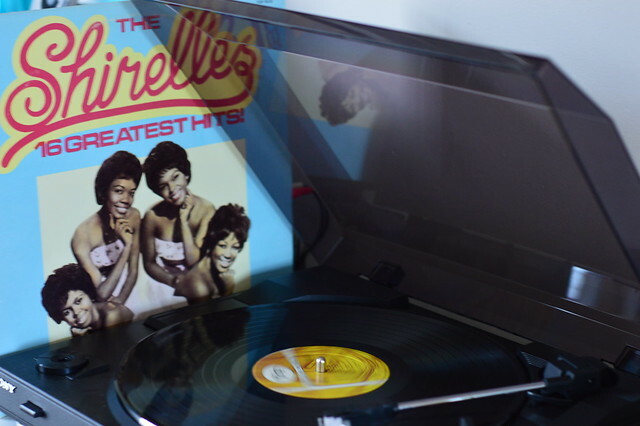 Actually picked up an original Shirelles single at the weekend alongside some neat old Johnny Cash and even more to add to my Motown collection. Can never have enough records that's for sure. Ahh I loved this post! I have a very tiny record collection (and currently no player) of about six - Graham Coxon's first solo album and a few Hefner EPs and also, funnily enough, a really old Futureheads 7" that they gave away at one of their early gigs before they got signed. 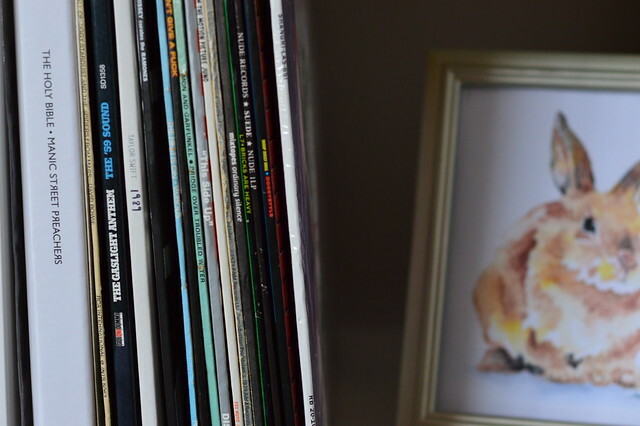 Definitely want to get myself a record player and start expanding my collection once I get my own place.